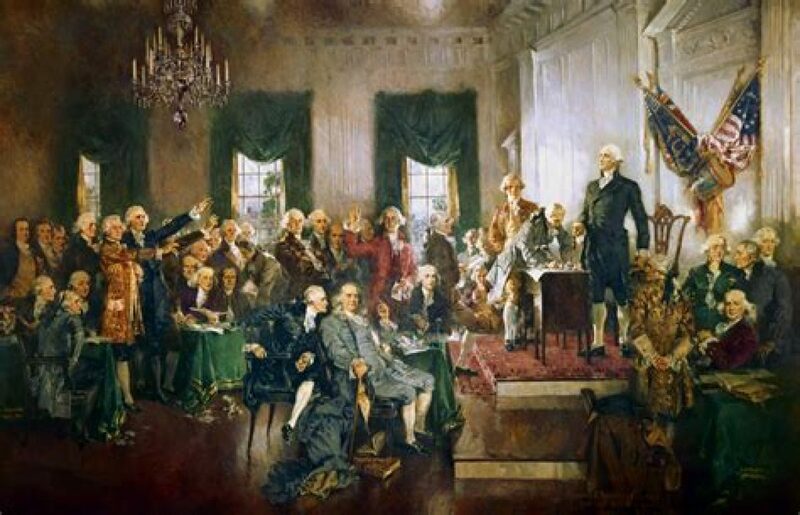 As the old adage goes the truth can sometimes be stranger than fiction. The realism – or lack thereof – with which war movies depict historical battles is one yardstick by which films in this genre are measured. Often, war movies are either mocked for getting battle details wrong, or praised for their accuracy. What better way could there be to attain extreme historical accuracy than by hiring actors who were once soldiers – who fought in the exact battles the movie depicts? This was the case in the making of The Longest Day (1962), which at the time was one of the most expensive war films ever made, featuring Hollywood heartthrob Richard Todd. Todd had actually fought in one of the battles portrayed in the film: that of Pegasus Bridge. Pegasus Bridge was a key point in the Allied advance on D-Day, and the taking of this bridge was integral to the success of Operation Deadstick, which was executed by the Airborne division of the British Army. 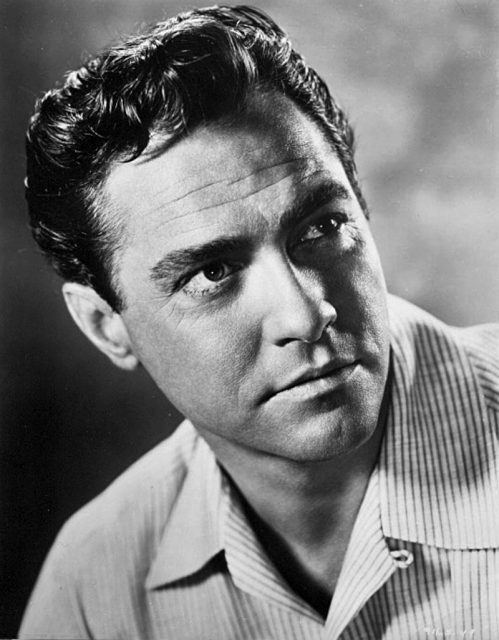 Publicity photo of Richard Todd. The objective was to capture two key bridges which would be crucial to the movement and advance of Allied troops during the Normandy landings. They were also important in terms of preventing a German flanking attack on the Allied troops as they landed on the beaches. The advance force of Operation Deadstick – the units charged with taking and then holding the bridges – consisted of D Company, 2nd Airborne Battalion, Oxfordshire and Buckinghamshire Light Infantry, led by Major John Howard. Richard Todd would later portray Howard in The Longest Day. 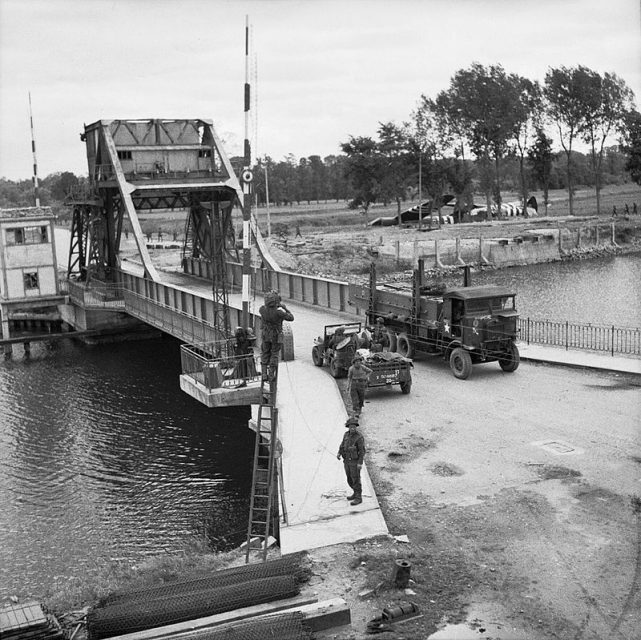 Pegasus Bridge, 9 June 1944; Horsa gliders can be seen where they landed. D Company comprised six airborne infantry platoons and one platoon of Royal Engineers. In what has been described as one of the “most outstanding flying achievements” of the entire Second World War, D Company was flown in by six Airspeed Horsa gliders, which were towed across the English Channel by Halifax bombers and released to glide silently to the ground when they crossed the French coastline just after midnight on June 6, 1944. Sixteen minutes after midnight the British troops were on the ground, and they launched their surprise assault immediately and with deadly force. In the event of an attack, the German defenders had been instructed to blow up the bridges because of their immense tactical importance, but the Germans were caught by surprise and did not manage to do this. Royal Air Force Flying Training Command, 1940-1945. 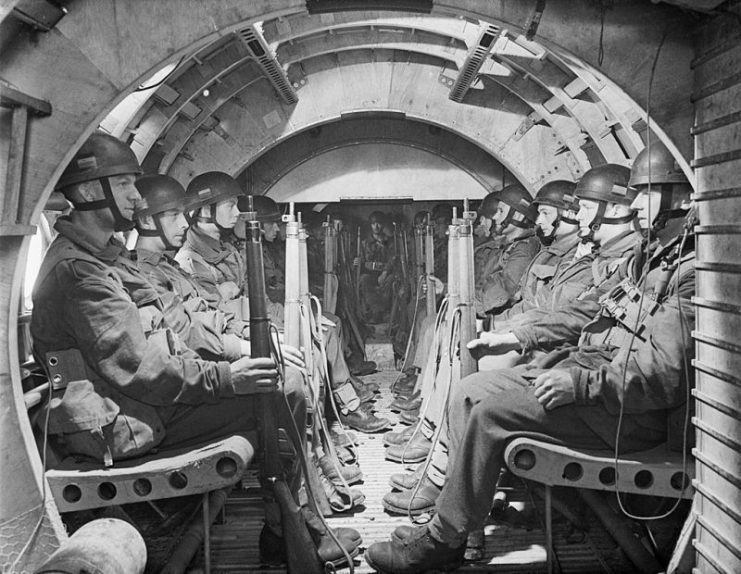 Airborne troops seated in an Airspeed Horsa of the Heavy Glider Conversion Unit at Brize Norton, Oxfordshire, ready for take off. The British troops advanced swiftly and fiercely, and by half past midnight it was all over and the bridges were in British hands. One of the British troops, Lieutenant Brotheridge, was shot through the throat and thus became the first Allied combat casualty of the D-Day landings. 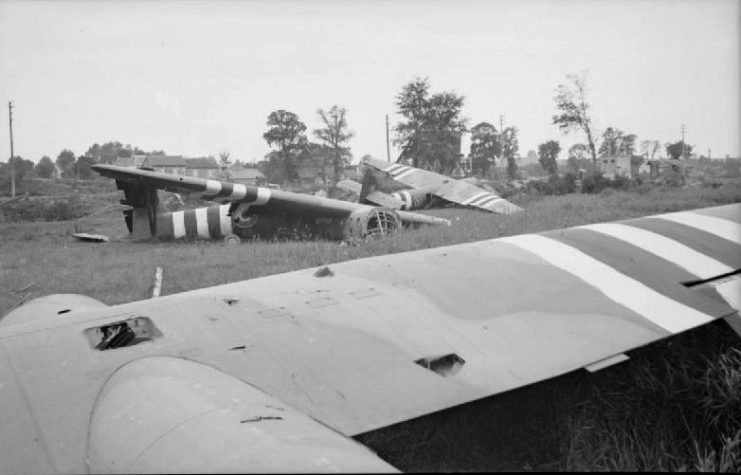 The troops brought in by glider for the surprise attack were then provided with backup in the form of 600 troops from the 7th Parachute Battalion of the 6th Airborne Division, who were parachuted in around forty minutes after midnight. One of these troops – the first out of his plane, in fact – was the actor Richard Todd, who had enlisted in the British Army in 1939, just as his acting career was starting to take off. By the time the paratroopers landed the Germans were already preparing to take back the bridges from the Allies, a goal they were prepared to achieve at any cost. Todd was among the 160 paratroopers who made it to the rendezvous zone – many others had drifted too far away with their parachutes, while some had landed in flooded marshes and drowned. The task with which Todd and the other paratroopers were charged was securing the bridges held by Major John Howard and his men, and preventing them from falling back into German hands. The task ended up being extremely costly, as the Germans counter-attacked with force. Another 65 British paratroopers were killed in the subsequent fighting on the bridges, which carried on for twenty-one hours. 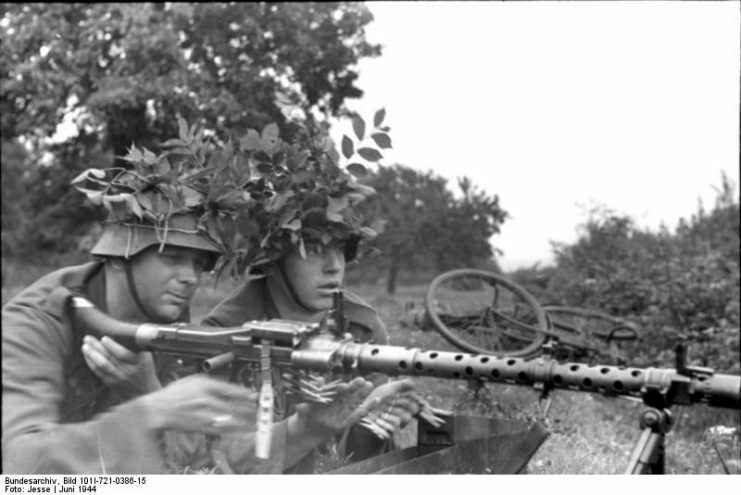 German soldiers with an MG 34 machine-gun. Operation Deadstick was, despite the heavy casualties, a success, and the Allies held the bridges. Hundreds of thousands of Allied troops who had landed on the beaches were then able to cross these bridges as they pressed onward into France. 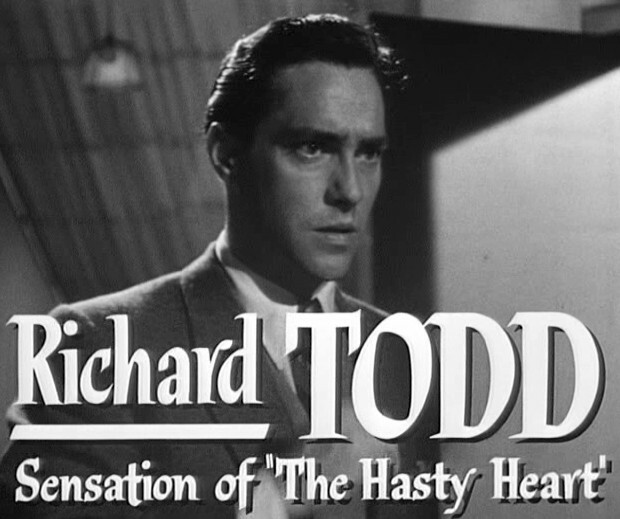 In the years after the war, Richard Todd got his acting career back on track and achieved global fame for his roles in movies such as Robin Hood and The Dam Busters. Operation Deadstick canal bridge gliders. 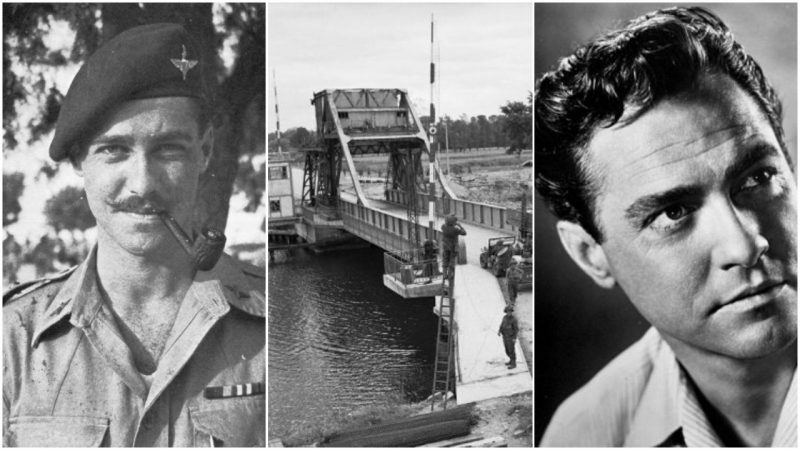 When shooting began for the epic war film about the D-Day landings, The Longest Day, Richard Todd ended up being cast, in a strange twist of fate, as the man he and his fellow paratroopers relieved when they arrived at Pegasus bridge in the early hours of the morning on 6 June 1944. Even more strangely, because Todd was playing the role of Major Howard, they had to hire another actor to play the role of Richard Todd. The movie ended up being a great success, and it wasn’t until Steven Spielberg’s Saving Private Ryan that another film about the D-Day landings made such an impact on audiences worldwide. Saving Private Ryan was noted for its recreation of the Omaha Beach landings. 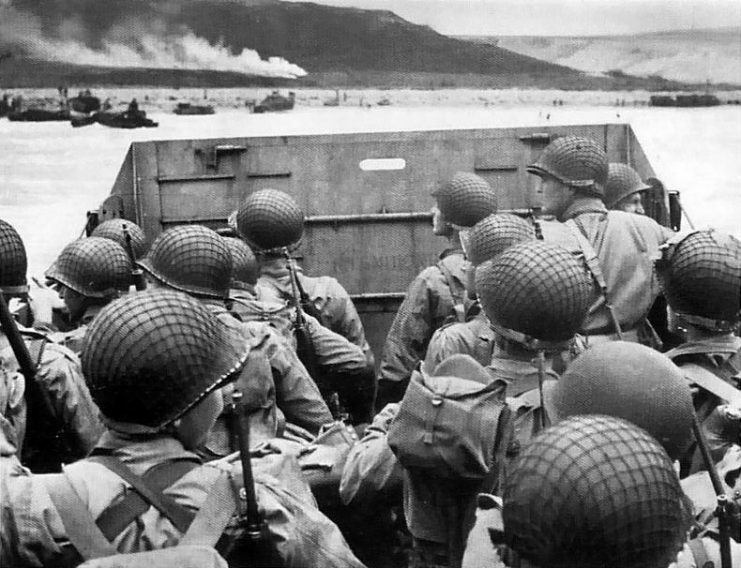 World War II, operation Overlord, Omaha beach. The Longest Day‘s battle scenes in particular were shot with huge numbers of actors and extras to try to convey the immense scale of the beach landings and the fierce fighting that followed. Todd would later describe the film set as being very realistic in terms of how he remembered the battle, which made it quite emotional for him to shoot the scenes.